“In the beginning...” And thus was launched the story of mankind, a drama that acts itself out daily in the three worlds of heaven, earth and hell. Indeed, we are a race of storytellers; we give meaning to our alternately divine, mundane and hellish lives through the stories we tell: through language, and through music. ‘Thrilogy’ (pr. Thrai-luh-ji) is one such musical narrative, a song without words to express the unspeakable. For on June 12th, three worlds will collide. And not a word will be spoken. Pioneering instrumental fusion-band ‘Thriloka’ (pr. Thrai-loh-kaa, lit. three worlds): enter stage right. The 18-piece ‘Contemporary Chamber Orchestra’, conducted by Manilal Weerakoon: enter stage left. Witnesses to the musical marriage: enter main hall. Doors close at 8:15pm. Lights dim. And from the most intimate of all sounds – silence – we begin the consummation of polarized musical entities. Warming you up to a rock’n’roller-coaster ride through the softly grooving temptations of exotica via the visions of psychadelia to the screaming pulsations of molten metal. Thriloka + Orchestra + You = Fusion at its nucleus-splitting hottest. Sparks will fly. (Come feel it yourself, don’t be shy). Surfing a wave of publicity following the release of their new music-video ‘Chimera’ and in anticipation of the forthcoming launch of their re-mastered album ‘Bisura’ on the M-Entertainment label (to be launched at ‘Thrilogy’), Thriloka – [Sarani Perera (guitars), Uvindu Perera (bass guitar), Eshantha Peiris (keyboards), Harshan Gallage (drums), and Pabalu Wijegoonawardane (percussion)] – is intent on taking their musical fusion to yet another ‘realm of higher listening’, and invites their fans to join them on this latest sonic exploration. Following the warm response to Thriloka’s ‘Dhyan Yathra’ concert series (also presented by ‘The Fusion Dhyan Arts Circle’), an on-stage collaboration with the 18-member Contemporary Chamber Orchestra seemed like the inevitable next-step, and with every aspect of the production [e.g. music, instrumentation, stage-setup, lighting, costumes (by Swanees), a guest appearance by Hollow-Point Halo’s Ranil Goonawardene etc.] geared towards the idea of a multiple-perspective narrative, ‘Thrilogy’ promises to be not just a musical journey, but a mind-trip as well. PS : Some interesting links of thriloka ! Treating the Sri Lankan audience to something unique and innovative, Thriloka – a bohemian band, has teamed up with the ‘Contemporary Chamber Orchestra’ to bring you Thrilogy. The challenge of playing alongside an orchestra has not been attempted by local outfits before. Setting the ball rolling, Thriloka will have initiated the concept, so you can be sure the concert will be a refreshing experience. The 18 piece ‘Contemporary Chamber Orchestra’ which will be conducted by Manilal Weerakoon, will provide a rich classical semblance to the music by Thriloka. Defining the genre of music played by Thriloka is a bit of a challenge. Their music cannot be pigeonholed into a particular genre simply because their sound is a concoction of varying types of music. There are a distinctive five main components of which their music consists. 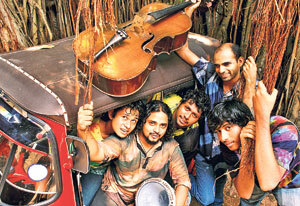 Those components include, Sri Lankan traditional folk music, Ragas, Jazz harmonies, progressive rock and funk grooves. Each of the five components is clearly introduced by each of the five members of the band. The band members have their individual influences and weave those styles into the final piece of musical composition.